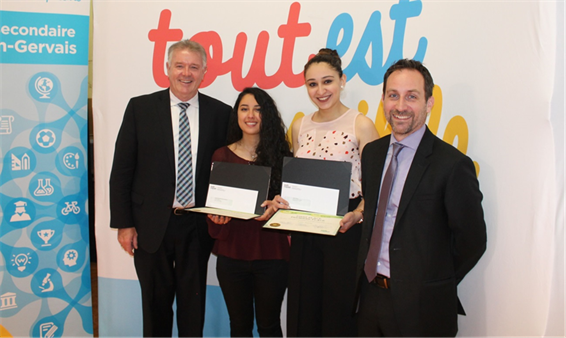 On May 19, Minister of Labour Kevin Flynn visited Oakville’s École secondaire Gaétan-Gervais to present awards to the first-place winners of Ontario’s 2016-17 It’s Your Job video contest. A 145-student assembly was held at the high school to congratulate Laila Aggag and Nicole Nseir on their win and show their video, Speak Out, to their peers. Minister Flynn presented the Grade 12 students with a first-place certificate and a cheque for $2,000. The school also received $2,000 in prize money. The It’s Your Job video contest was open to all high school students. The contest required students to create their own 2-minute videos about workplace health and safety. Videos were judged on their message and creativity and three winning videos were chosen. First, second and third-place video teams were awarded $2,000, $1,500, and $1,000 respectively, with equal amounts awarded to their schools. Ontario’s first-place video, Speak Out, was submitted to compete nationally for a chance at additional prizes. This year Ontario had tough competition at the national level and a video from New Brunswick won top honours. You can watch Ontario’s winning videos on the ministry’s contest webpage. National winners are posted to the national contest webpage. Keep an eye out for next year’s It’s Your Job contest next fall – your students could be winners next year! Photo: Minister Flynn, Nicole Nseir, Laila Aggag and Jean-François L’Heureux, Board Chair. More than 1000 grade ten students now have a greater awareness of health and safety on the job, courtesy of a recent collaboration between Workplace Safety & Prevention Services (WSPS) and the Ottawa Catholic School Board (OCSB). A group of 20 WSPS volunteers and staff members successfully delivered the "Health and Safety Awareness Presentation" (HSAP) in 41 sessions at 14 different schools over a two day period (April 26-27). The target audience was Ottawa-area grade ten students, who are at an age where they may soon take on their first part-time jobs. The aim of the HSAP curriculum is to make health and safety simple while ensuring participants are aware of their rights and responsibilities, including who to turn to and what to expect, under the Occupational Health and Safety Act. Formerly known as the "Young Worker Awareness Program," HSAP was co-developed by WSPS and the legacy association, the Industrial Accident Prevention Association (IAPA) in 1996 and initially targeted high school students. Since 2008, WSPS has been steadily expanding the program to serve new Canadians and other vulnerable workers, such as seniors. Free of charge, the one-hour sessions are delivered by trained WSPS volunteers at classrooms and community centres across the province. If you are a teacher and interested in booking a HSAP at your school this fall, please contact Shabniz.Jaffer@wsps.ca. The body normally cools itself by sweating, however during hot weather, especially with high humidity, sweating isn't enough. Body temperature can rise to dangerous levels if you don't drink enough water and rest in the shade. You can suffer from heat cramps, heat exhaustion or heat stroke. Any worker exposed to hot and humid conditions is at risk of heat illness, especially those doing heavy work tasks or using bulky protective clothing and equipment. Some workers might be at greater risk than others if they have not built up a tolerance to hot conditions, including new workers. Young workers are at an even higher risk if their central nervous system is not fully developed. Learn more about heat stress and how to prevent heat-related illness. Ontario has launched inspection blitzes to ensure new and young workers, such as summer student employees, are safe on the job and know their rights at work. Did you know the Employment Standards Act, 2000 (ESA) sets minimum standards for things like pay, work hours and time off. Most workplaces in Ontario must follow this law and employee rights are the same whether you work full-time or part-time. As the school semester is quickly wrapping up, many students may find themselves working during the summer months. There are a many resources and reminders available to students before they begin working this summer. Are young workers who are part-time employees covered by the ESA? Are young workers entitled to a lunch break or coffee break? Can an employer deduct the cost of a uniform, or other items, from an employee’s pay? Can an employer withhold, make deductions from or require an employee to turn over their tips and other gratuities? Are young workers who are employed in retail required to work on public holidays and on Sundays? What if the employer does not follow the ESA? For additional information, please visit the Young Workers page on the Ministry of Labour website.